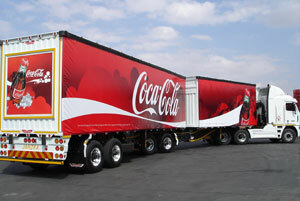 Locally manufactured beverage trailers have been put into operation right across the continent in such countries as Angola, Zimbabwe and Zambia. South African trailer manufacturers look set to emerge from the 2008/2009 economic recession in reasonable shape but there is still a long way to go before it is on an even keel writes Andrew Parker. A number of leading trailer builders approached by FleetWatch for a status update on what is taking place in the local market report that the industry has taken a seriously hard knock in recent times with at least nine companies going to the wall and quite a few more surviving month-to-month. One thing is quite evident, this sector of the road transport business will never quite be the same again. Trailer manufacturers are reportedly currently cutting each other’s throats in an effort to secure enough business to stay in the game. Customers, as is their wont, play one off against the other. It is an open market and nobody is breaking the law. A positive aspect of this new recessionary market is that while customers are shopping around, they have become quite circumspect over what they like and dislike. They are demanding trailers of the highest possible quality and reliability; equal to anything you will find in most developed countries and which will withstand the rigours of the operation they are intended for. They also want high quality, reliable aftersales service. Moses Naidoo, marketing manager at Henred Fruehauf, which is currently operating at around 80% of total capacity, says one of the difficulties manufacturers are facing is that market uncertainty is making it difficult to maintain healthy order books. This means producers are unable to plan too far ahead in terms of hiring staff, buying materials and so on. Also, because of this and the fact customers are indecisive, by the time they do commit themselves to place an order, the original costs may have gone up. Frustrating though it may be, Naidoo says for its part, the company is managing these challenges head on. While no particular market segment is overly dominant, Naidoo says they are picking up a fair number of orders and enquiries for side tippers and flatdecks of which a fair number are for the export market. Flatdecks are one thing but seeing as there was a reported glut in the market for side-tippers just a year ago, the news that this sector is now buying new trailers comes as a bit of a surprise. Naidoo explains that since the side-tipper market really took off some five years ago, a lot of developments have taken place in terms of hydraulic systems, certain chassis modifications and even the shape of the actual tipper body, or bin, itself. Further to this, he says a large number of side-tippers are now reaching their replacement date. Unlike most trailer derivatives which have a useful economical life cycle of up to ten or fifteen years , that’s if they are properly serviced and maintained – side tippers operate in harsh conditions and, according to Naidoo, generally need replacing within three to five years. Leon van der Wetering, marketing manager at Pretoria-based Afrit Trailers, notes that refurbishment as an alternative is increasingly being looked at by fleet operators. He says that depending on the condition of the trailer, it may be possible to replace just the load body. It all boils down to what the refurbishing will cost compared to that of a new trailer. FleetWatch also spoke to Bloemfontein trailer manufacturer Trailord. MD Rui da Silva has been in the trailer game for over three decades and apart from having a number of international design awards under his belt, is a very astute operator and a well of information about the local trailer business. Before he discusses recent developments in the marketplace, he reports that Trailord, which he founded on a shoe string some years ago, actually closed down last year and only recently re-opened for business. He confirms that truck operators are also more concerned with the overall quality and finish of the final product than they were in the past. “These are definitely positive developments and should go some way to eliminating the rat and mice trailer builders which have plagued the industry for years with poor quality and service,’ he says. Commenting on the closure of the Trailord factory last year, Da Silva says in spite of sitting on a number of lucrative contracts, circumstances made it impossible for the company to continue operating. He says that among other things, labour issues and militant unionisation played havoc with the company’s production schedules. “Trailord is not alone in this,’ he says. “Unfortunately, much of our unionised laws in South Africa are not designed for productive employment. Quite often, a small group of corrupt employees influences and intimidates the rest of the work force often leading a “go slow’ or strike. These same employees are protected by labour laws and often use union agendas as an excuse. For a small company, this can have devastating consequences. “This is evident in every sector of commerce and industry; mining, engineering and even within the government and civil service. Quite simply, there is an over abundance of union politics on the shop floor and business has allowed itself to get snookered into this situation. In the end, the masses win and the company owners get penalised in spite of the fact that they are trying to create jobs. Moving on from this, while some players have had – or are still having – a tough time and others have vanished off the map, one trailer manufacturing organisation appears to have come through the recessionary monsoon season smiling all the way to the bank. Charles Lovell, business manager for the KearneyGroup, claims the company has been enjoying a successful run of good fortune so far this year. Lovell, who reached a 50 year milestone of service to the South African road transport industry this year, says while Kearney’s streamlined its operations by closing its Pietermaritzburg facility and moving it to Durban, this has not affected production. Looking into the future, Lovell says depending on what happens with production costs in this country, it is not impossible that trailers will be imported into South Africa from places like China. Van der Wetering also believes imports could soon become a reality in the South African market. He says he has seen a number of Chinese manufactured trailers operating in Malawi and was pleasantly surprised at the high quality of the products. “Just like anywhere else in the world, China has good and bad suppliers. I have, however, heard from some operators that these Chinese trailers did not perform as well even over a long period of time. While South Africa struggles to gain momentum in what is actually a growing domestic market, it seems the rest of Africa is providing the bread and butter for South Africa’s trailer manufacturers – and that is not a bad thing at all.